Watch the sunset over Djemaa el Fna from a rooftop terrace, while sipping mint tea; have an early dinner on a rooftop terrace of the many restaurants in Place Djemaa el Fna and drink in the views as Marrakesh starts to twinkle. Shopping and haggling in the souks; Take a deep breath and lose yourself shopping in the labyrinth maze of the souks. Carpets, leather goods, lanterns, ceramics, throws, jewellery, argan oil. Name your wish…and it shall be granted. Bargain hard though! Take a leisurely city tour in a horse-drawn carriage; Calèches are a wonderful alternative to the red double-decker city tour buses. An hour is plenty and children will love it. Bargain powers required once again. Have dinner in the makeshift foodstalls in Djemaa el Fna; At dusk, chefs and waiters set up their foodstalls amongst snake charmers and fortune tellers in the main square. Kefta, tanjia and harira soup are all on the menu. Avoid tummy troubles and drink bottled water. Relaxing in your riad; Escape the medina bustle and retreat to your riad for a few hours. Laze on a sunny roof terrace, have a dip in the pool or steam up in the hammam. Have you been to Marrakesh? What would be your recommendations for favourite things to do? Please add your comments; we’d love to hear them. 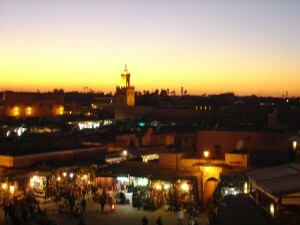 This entry was posted in Destination Insights, Need an idea and tagged Marrakesh, Things to Do. Bookmark the permalink.